How about something revolutionary in the world of recycling? Why isn’t recycling simpler so that we all know which packaging can be recycled and where to put it? How many times do we have a look at a piece of plastic film or a plastic tray engulfing a small morsel of food and wonder, is that recyclable? Currently we look for some kind of recycling mark or symbol and then become confused as to what it means. All councils in UK come together and agree on a uniform number and colour of bins for each household. At the same time they have to agree which materials they can all recycle. Initially this could be a stumbling block because different councils have different recycling facilities. However nothing is insurmountable, as other countries have proved. Black for items that cannot be composted or recycled. Next the joint councils go to packaging manufacturers and ask for a simple change to packaging. If a material can be recycled it has a blue bin shape printed on it. If the packaging is organic and compostable then a green bin shape is printed. 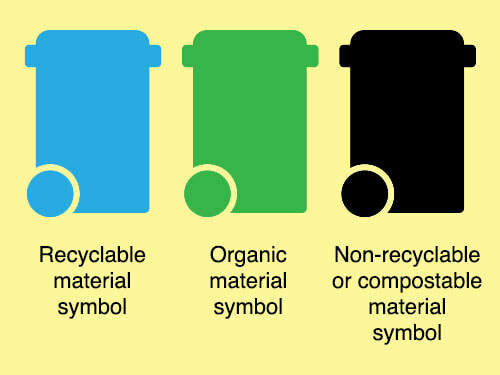 Similarly if a material is not recyclable, then it has a black bin shape. Then all consumers simply marry up the colour bin shape on the packaging to the correct colour bin outside their home. There you have it, recycling made easy for everyone. EcoFrenzy idea for consistent and easy to understand recycling and packaging symbols.